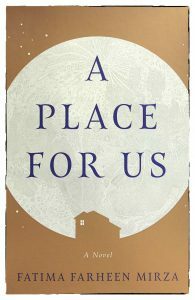 A deeply affecting and resonant story, A Place for Us is truly a book for our times: a moving portrait of what it means to be an American family today, a novel of love, identity and belonging that eloquently examines what it means to be both American and Muslim — and announces Fatima Farheen Mirza as a major new literary talent. A Place for Us by Fatima Farheen Mirza is a complex, intense and layered family drama full of emotional conflicts, everyday struggles and simple joys. An endearing and heartfelt saga that spans decades, it is bound to leave a mark on its readers. The story revolves around an Indian-American Muslim family trying to embrace their life in America along with preserving their culture, faith and traditions. You see, as an Indian Muslim living in the US for almost a decade now, and having faced some very similar struggles, my expectations of this book were set high when I read the blurb. I was curious as to how Fatima Farheen Mirza would portray those tiny battles, little conflicts and emotional dilemmas we go through on a daily basis. Would she be able to paint a picture that is close to reality? Will it be possible for her to spin a story and create characters that every reader would be able to relate to at some point? And most importantly will the story manage to stay with its readers? I needn’t have worried about any of these because Mirza surely knows what she is doing, her storytelling is flawless. With carefully constructed characters and a simple yet stunning prose, that at times feels almost poetic the author has woven a slow burning tale of love and heartbreak, faith and identity and of trying to fit in without having to let go of one’s customs in a world where cultures collide. It all begins with the wedding of Rafiq and Layla’s eldest daughter Hadia. The younger sister Huda is helping the bride get ready, the parents are busy checking and rechecking the arrangements, but underneath all the celebratory hum is a quiet anguish. The wayward youngest son Amar has returned home for his sister’s wedding. The son that ran away from home several years earlier is back and yet no one in the family has asked him anything. They are all just savoring his presence. What happened? The story gradually unfurls, by us getting glimpses into the memories of Hadia, Layla and Amar, as they reflect on the time that passed, major decisions, life’s milestones, tiny stolen moments that finally led to this present day. These non-linear memories , these multitude of emotions, decisions, failures, regrets and the many intricacies of life is what makes up this story. Worth mentioning is the last few chapters which contains Rafiq’s point of view and is possibly the most heart-wrenching portion of the book. To get to peek inside the heart of an extremely strict and seemingly unbendable father was certainly not what one would expect. These last few pages are profound and intimate that would certainly break your heart. And so will the ending. A complex, diverse and character-oriented family saga, A Place for Us is a poignant story that will not disappoint. In every way a gem of a debut and highly recommended. Disclaimer: An e-ARC provided by Crown Publishing via NetGalley in exchange for an honest review. All opinions are my own. This sounds lovely!! I’ll have to check it out! I highly recommend this if you enjoy contemporaries! Excellent review! I’m looking forward to reading this!